Next: Red Velvet Christmas Bars with Egg Nog Glaze! Dairy-Free! THAT’S ME! Right now. I love Thanksgiving.  I love the togetherness, family, friends, relaxing, laughing, and of course, feasting on delicious food. Pie is one of the Thanksgiving foods I look forward to the most. When I was a kid, my mom, aunt, grandma, and I would all make pies. We would purposely make more pie than we’d need for Thanksgiving day so that there would be leftover pie to keep eating days after the Thanksgiving feast is over. One of my favorite memories is eating apple pie for breakfast the morning after Thanksgiving as a family. Nothing beats pie for breakfast!! it’s naturally dairy-free! Whether you need it to be or not, there’s no dairy in this deliciousness. The crust is made with half whole wheat flour – THX for the fiber & whole grains! You can let your creativity out! How do you want to do the pie crust? Lattice top? Shapes? Slits? The choice is yours! YUM the house is filled with that undeniably cozy sweet scent of sugar & apples. And yours will be too in just a bit! Let’s Bake! 1) First, let’s make the crust. In a large bowl, whisk together the flour, 1 Tablespoon granulated sugar, and 1 tsp salt. Using a pastry blender or two knives, cut the shortening into the flour mixture until the butter is in small pieces– about the size of a pea– and fully incorporated into the flour. 3) Divide the dough into two balls and flatten each slightly into a disk. 4) On a lightly floured surface, roll out one of the dough balls into a 10-12 inch circle. I typically flip the dough 3 times, making sure to flour the surface each time before continuing rolling. 6) If you have more than about an inch of overhang of dough over the edges of the pan, trim them down to about an inch. We’ll *finish* the edges after we put the top-crust on. 9) To the apples, add the brown sugar, granulated sugar, flour, cornstarch, cinnamon, pumpkin pie spice, salt, and lemon zest and stir using a wooden spoon until the mixture is evenly distributed on all of the apples. 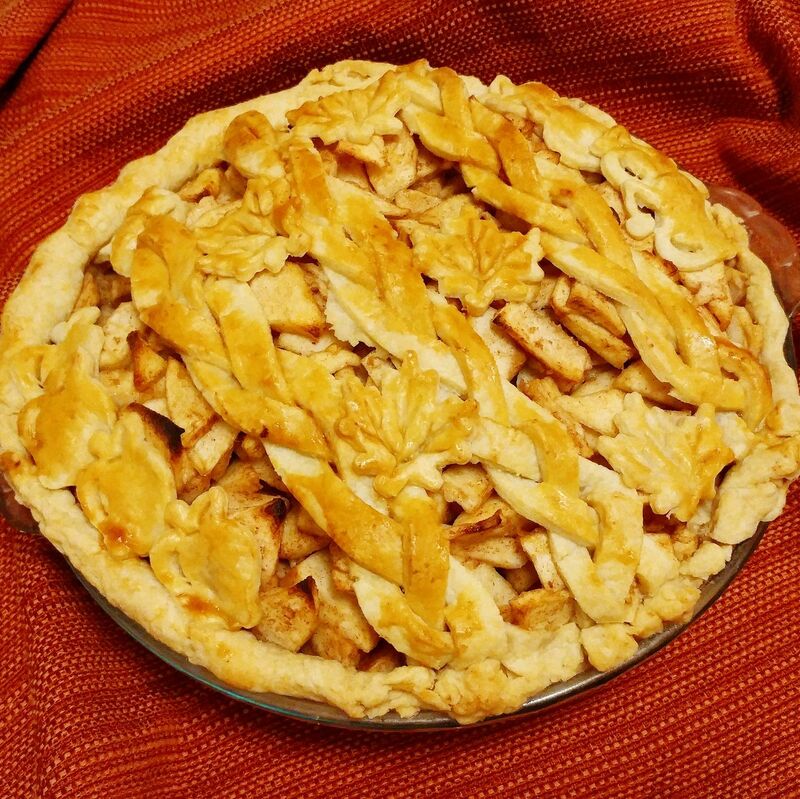 10) Put the apple mixture into your prepared pie crust. There are a LOT of apples. You might have to balance them…it’ll be a big ol’ apple mound. 11) Roll out your other ball of down on a clean floured surface/pastry board. The shape doesn’t really matter. You want it probably about 1/8 of an inch thick. If it’s thicker or thinner, that’s ok. It’s just most important that it all be the same thickness. 12) Now, the choice is yours on how you want to do the top crust! In the pictures here, I cut 9 long thin strips of dough. Then, took 3 at a time, and gently braided them on top of the pie. I also used leaf and apple shaped cookie cutters to cut out dough shapes. You could do lattice top, or other shapes, or, the classic solid top crust– just like the bottom crust! 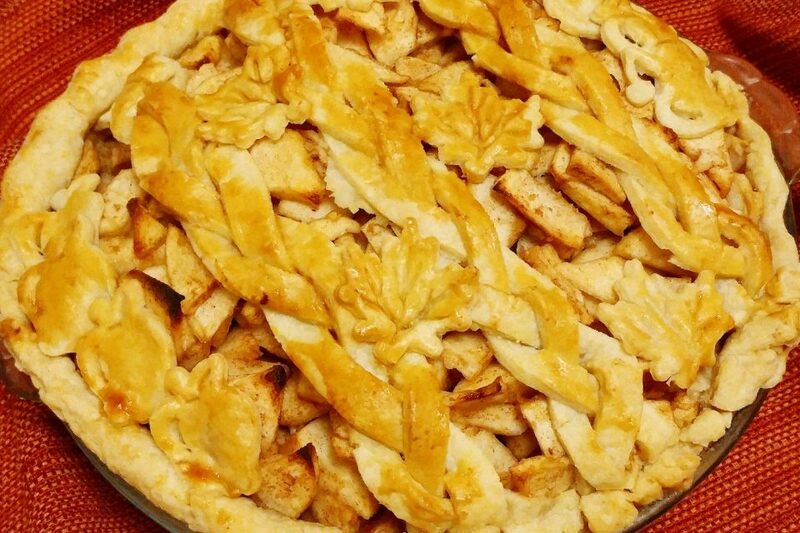 If you do put the whole second crust on top of the apples, just make sure to cut a few slits in the dough. That way, the steam can escape from the pie while it bakes. Crimp the edges of the pie to your liking. 13) In a small bowl, whisk an egg. 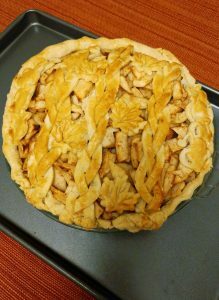 Using a pastry brush (or your clean fingers) put a very light coating of the egg mixture all over the crust of the pie. This will help you to attain that desirable golden brown color. Place the pie on a baking sheet. This will catch any drips while baking, so that they don’t drip onto your oven. 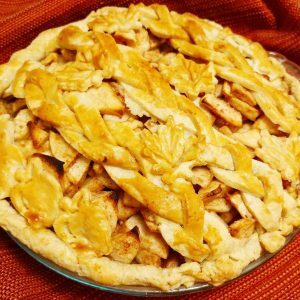 14) Bake the pie on the baking sheet in the preheated oven for about 1 hour, or until the apples are bubbling and the crust is golden brown. The trick to making sure it’s cooked enough to have that soft, gooey apple filling? If the filling isn’t bubbling, it’s not done yet! So keep on cookin’ it until the pie is bubblin’! How do you eat your apple pie!??? Enjoy!